This is a two parts series. Originally I wrote this article in German for the online photo magazine FOTOESPRESSO. Find the GERMAN VERSION here. You're probably wondering what photography, meditation and yoga have in common. At first this may sound unusual, but in fact it is more obvious than you would expect. Don‘t worry, this is it not another hipster trend à la ‘deeply relaxed with my camera in hand’. I would like to tell you in this article about my personal experience in the last 15 years of the enriching connection between these different disciplines. How did I get to meditation and yoga? First photography was in my life. With hindsight, I should say that taking pictures, and especially spending time in a photo laboratory, is/was a meditative act or at least hopefully should be. In 1995, when I began to work as a Feste Freie (fixed freelancer) at a newspaper in Dortmund, I still photographed on film. There was no hectic clicking through just taken photos on the camera screen like we sometimes do today. To share them instantly with whoever anywhere in the world was science fiction. That gave something somewhat calm to photography. I could completely engage with my subject without losing concentration. That was one of the aspects of photography that I particularly liked. So it's not completely surprising that I should later find a love of yoga and meditation and discover a deep connection between these practices that totally support each other. I came unexpectedly to yoga in an unusual location in the summer of 2003 – the jungle in northern Thailand. I was volunteering in a sanctuary for rescued elephants and was working on a photo reportage about the situation of elephants in Thailand. For two weeks I shared a tiny, half open, simple bamboo hut with an inspirational woman from the States, Wendy. 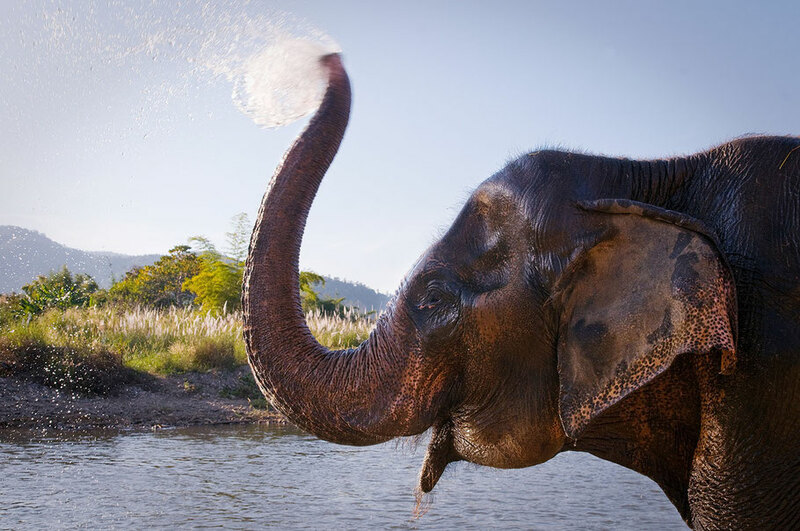 In the middle of the jungle, I also kept the company of many wonderful and gentle elephants and their respective keepers, a cook and some other volunteers. Wendy did each afternoon some quite strenuous yoga on our hut’s mini-terrace and once in a while an elephant would often stick its trunk through the bamboo balustrade to check if we had a banana or two for her/him to snack on. Since we usually had nothing to do at noon and the light was not suitable for photography, I let Wendy persuade me to try some yoga with her. I discovered a whole new world, which was not that far from my beloved photography. She gently introduced me to meditation and to my surprise, I realised that it was about finding inner peace and training concentration and perception. Day by day, I let go of my subliminal reservations and found out how it supported me whilst taking photos. When I returned to Egypt, I started to be intensely involved with yoga and meditation. Later, I did a training to become a yoga and meditation teacher and have continued to expand on my knowledge since. Since then yoga and meditation accompany me alongside my photography. Me hanging out with a rescue dog on our tiny hut terrace, yoga mat behind me! So what do meditation and yoga have in store for photography? Meditation and photography are all about feeling the moment, to be fully present in the here and now. Meditation helps us to train our concentration and patience. These are essential qualities for being able to capture the right moment with our camera. Also yoga, combined with conscious breathing, promotes this ability. Our breath is always present and our focus on it helps us to stay in the present moment and not to distract ourselves with each and every thought. The breath is always there. 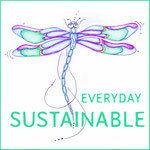 Breathing is not a conscious decision we can make. If one realises this and begins to observe it, then this can be often an exciting experience. It makes us aware that we are alive. It's the same with seeing. Our eyes are constantly taking in information, but rarely do we stop to combine them to a picture (a possible photo). Often, seeing happens only incidentally. Therefore, we have to train conscious seeing. Almost all movements and positions in yoga are connected with conscious inhalation and exhalation in order to discover mindfulness, together with a sense of one's own body and the interplay between movement and breath. For many positions, one needs concentration and attention to keep the required balance and coordination. A careless moment and this equilibrium can be gone – similar to photography, where the art consists of framing the shot and pressing the trigger at the right moment. This moment can often only be found with a complete concentration similar to that which we develop in yoga. Yoga and meditation are a wonderful way to improve qualities such as concentration, mindfulness and conscious seeing and get creative processes started. To be able to capture that special moment requires concentration and patience. Qualities, that in our fast paced world often don’t come easily – we too readily use our phones, or more often than not walk around constantly distracted by them. We quickly focus the camera on something or ourselves, use auto-correction and run a pretty filter over it, then immediately share the photo on social media before we can even reflect what was photographed or why. Not very creative and definitely not meditative at all. How many moments do we miss because we were lost in thought staring on our smartphone without really perceiving our surroundings, without really seeing? How does that apply to photography in practice? 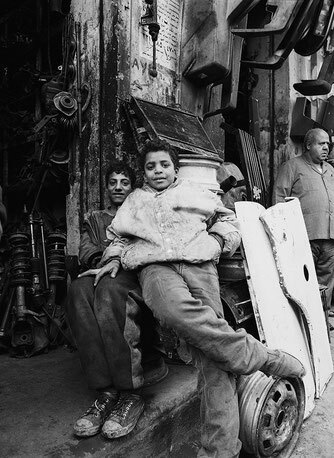 I love street photography – my interest grew here in the ten years I lived in Egypt, and since then I have dedicated much of my work in this field. In Egypt, there is plenty of light, almost no rain and numerous interesting motifs to be found – one just has to know how to capture them. For one photo project, I spent many days over several weeks with my camera in one district that consists only of car repair shops. There you find all the spare parts of almost every car ever produced, an incredible bustling warren of workshops. Many of the components are even displayed decoratively on the buildings, evoking the feeling of some huge junk-metal art installation. There was noise, laughing, haggling, tea drinking, and many mechanics also kept a few sheep on the side. The art for me was, as a blonde obviously foreign woman, to become invisible with my camera. I often spent one or two hours squatting completely motionless, leaning against a wall, only a few meters away from a workshop. I watched the bustle, men at their work, customers come and go, and was highly concentrated to see and feel the moment. Just as I would have been in a meditation, I was very quiet, just with open eyes and a finger on the trigger, to be able to take that photo at the right moment. After some time, the people forgot my presence and I kind of became one with the scenery. It's a magical moment, when one reaches the point of inner peace and at the same time heightened concentration. All the senses, not just the eye, are alert. Images are created with the inner eye, taking in the light, shadow, colours, and lines very precisely. The image structure almost happens by itself. I am then absolutely in the 'flow'. And then comes the right moment, that split second, in which everything is just perfect for the shot. Already while pressing the shutter button, I know that I have managed to capture the exact moment I need. This is how it feels while meditating or practising yoga when suddenly voices like, "What am I eating tonight”, that itching of the nose or pain in the knee have all but disappeared. The total presence in the now and simultaneously resting peacefully in oneself is a wonderful state. 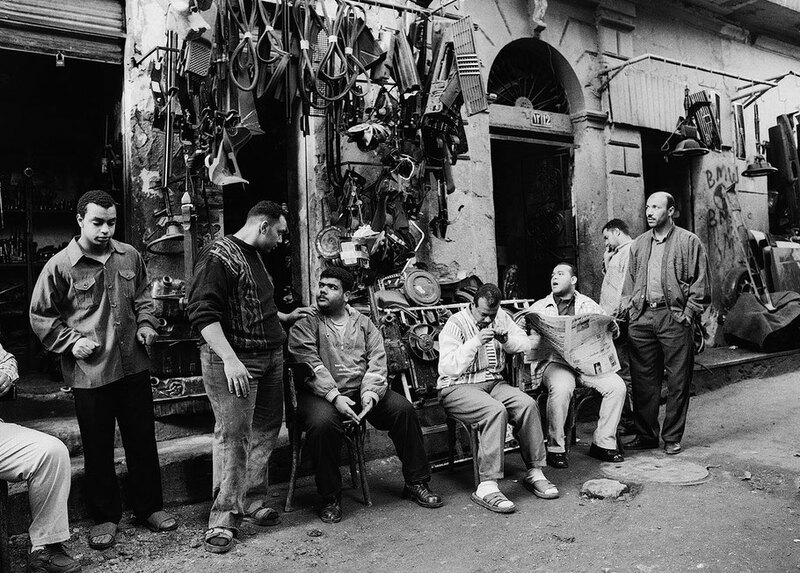 EGYPT, CAIRO: A whole quarter of Bulaq Abu Ela is inhabited by car mechanics. One can find spare parts of all sorts and experienced mechanics can fix any type of car. In 2018 I offered my first "Photography-Yoga-Meditation-Sound" workshop only for women. In May and Oct 2020 I will be offering another two in Seville, Spain. We will bring photography and meditation and yoga together. If you love photography, yoga and creativity and you would like to spend five intensive days with like-minded women in one of Europe's most beautiful cities then this workshop is excatly for you.